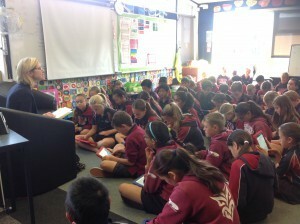 I was lucky enough to be invited to Papamoa Primary and Te Akau ki Papamoa Primary to talk to Year 5 and 6 students about writing and being an author this week. What a great couple of sessions! I was so impressed with the questions the children asked of me, the knowledge they have and the passion they showed for their own stories and for books. We talked about Brave’s Jour ney and the planning and writing that went into that. We talked about drawing maps. We chatted about fantasy quests, how old I was and (when I was a kid) what I wanted to be when I grew up. At the end we did a world building exercise to fire up the imagination. Since the visit, I’ve heard that the kids have dived into writing projects with passion and enthusiasm, so I’m thrilled I was able to inspire. Wow..we had an extremely motivating visit by the New Zealand famous published author Jan Goldie. She spoke to us all about the writing process, what it means to be an author and introduced us to her published books. Jan’s latest is called Brave’s Journey, and we were hooked after she read an exciting and attention grabbing, part of this.